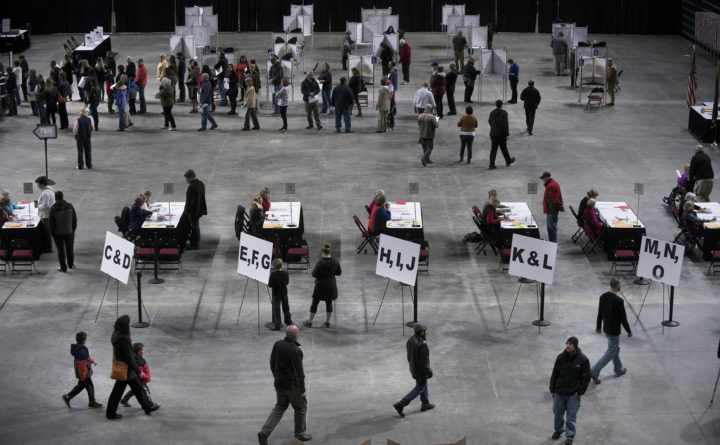 People vote at the Cross Insurance Center in Bangor Tuesday. Although turnout was predicted to be low, election officials in several towns said there was a steady stream of people. Maine voters approved a constitutional amendment to double the amount of time state pension managers have to compensate for losses, according to a projection by The Associated Press. With 52 percent of precincts reporting at 9:50 p.m. Tuesday, vote tallies showed support for the constitutional change at 62 percent and opposition at 38 percent. The change voted on Tuesday would provide a 20-year amortization period, doubling the time the state has to catch up after market losses. That will reduce big swings in what the state pays into the system year to year. The retirement system stewards an investment pool for more than 70,000 government employees, teachers and retirees. The system is funded by contributions from members and appropriations from state government. The state’s payments to the system have ranged from nearly $400 million in 1995 to around $320 million in 2017. Strict measures put in place when the retirement system was nearing insolvency in the early 1990s mean the state and system must compensate for dips in the investment markets within 10 years. That’s more of a state burden than it used to be because the size of the pension system’s investment pool is $10 billion now, compared with $3 billion then.